Outline | Kiyosumi Gardens | Let's go to the Gardens. In 1878, the founder of Mitsubishi, Iwasaki Yataro, chose this property to use a garden for the enjoyment of his employees and entertainment of important guests. After the design and construction phases ended, the garden opened in 1880 under the name of "Fukagawa Shimbokuen." 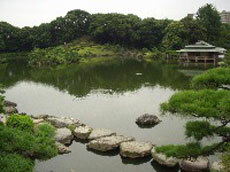 In later years, the waters of the Sumidagawa were brought into the grounds to make the pond. Hills and waterless waterfalls were constructed and famous rocks from all over Japan were brought in to embellish the garden. The garden was completed in the Meiji Period and developed into a famous strolling-style tree-filled design centered around a large pond. On March 31, 1979 this garden was designated as Tokyo Metropolitan Place of Scenic Beauty. In addition, there was a Tudor-style red brick residence designed by the English architect Josiah Condor on the grounds. This building was, however, destroyed by fire in the Great Kanto Earthquake of 1923. *20% discount for groups of 20 persons or more.